When Karl Stegmann founded his felt manufacturing firm in Kelmunz, Bavaria in 1888, the most important thing for him was the wearablilty of his felt shoes. 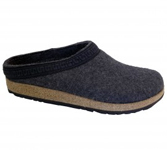 Right from the beginning, natural raw materials such as wool, felt, leather, and cork have provided the basis for ecological foot comfort. Stegmann can look back with pride on the world-wide success of its footwear that has offered Pure Comfort since 1888. • The original with the wool mark • Made from especially dense felt Stegmann supports American workers. All Stegmann clogs are assembled in an American factory here in the USA and support the American workers. Don't let someone pull the wool over your eyes... Wear the original.